There once was a king. He had twelve ministers to whom he had to choose one prime minister. Daily, the ministers would come to him with many gifts and great news about his land, never sharing any of the bad news. 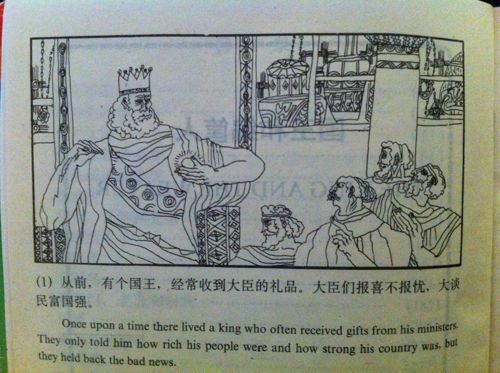 The king one day wandered into one of his villages disguised as a common man. He heard the sound of a harp and followed it down a lane. The weaver took the king to a small room where two people lay. The weaver said “These are my parents. They are my debtors. My parents brought me up and now that they are old I take care of them.” The king nodded. Back at the palace the king called his twelve ministers together. He said “A man who weaves one basket each day supports a family of nine by it and at the same time, he pays debts as well as makes a profit from it. The twelve ministers were puzzled and searched high and low thinking the king must have heard a riddle. Finally the ministers found the weaver and try to get the answer out of him. The weaver said the king told him he could not tell anybody. The ministers continued to beg him with increasing amounts of gold pieces. The ministers were so eager for an answer they finally promised to give the man one hundred pounds of gold pieces. The weaver still shook his head and said no. One of the ministers then took out one thousand gold pieces. The weaver finally accepted the money and explained the words to them. The ministers returned to the king with the answer as if they had discovered the treasure/answer themselves. The king thought the weaver must have given them the answer. The king went back to the weaver and asked him why he didn’t keep his word.